Please use these resources to inform and direct your personal or corporate prayer times for Yemen. If you have any questions, please contact our team. We would love to be a resource to you as well. The war in Yemen has often been portrayed from a global vantage point involving international politics and economics, high-profile persons, and statistics numbering in the millions. As a community of people who care about and pray for Yemen, we want to allow our prayers to become deeply personal. This prayer guide is a fictional account intended to portray life and the war in Yemen through the eyes of an average Yemeni. This prayer guide is ideal for any individual, family or group interested in engaging in strategic, effective prayer for Yemen with a deeply personal perspective. Each day includes Scriptures to pray, a fictional account of a fictional character in Yemen, information on various aspects of Yemen and its culture, and specific prayer points. Consider reading the story and included prayer points each day, perhaps in the morning, during a meal, or at bedtime with your children. For churches or small groups, consider committing to pray through this guide corporately. Worldwide media may be focused on other world events, but God is very much aware of the hardship currently befalling the Yemeni people. As a community of people who care about and pray for Yemen, we want to become more educated about ways we can pray with one voice for the people of Yemen. 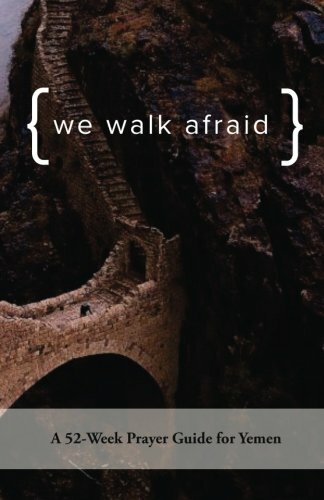 Rather than walking in fear of manmade hardship, we pray that the Yemeni people would walk in fear of the Lord. This prayer guide is ideal for any individual, family or group interested in engaging in strategic, effective prayer for Yemen. Divided by topic and weeks, we recommend beginning your week by reading the short paragraph of information followed by several minutes of focused prayer. For churches or small groups, consider taking 5 minutes of your formal gathering time to read from the booklet and pray as a fellowship of believers for Yemen. Yemen is a country rich in its history, culture and traditions yet these aspects of Yemeni life are shrouded by the tragedy of politics, tribalism and oppression prevailing throughout the land. As a community of people who care about and pray for Yemen, we want to provide a look into the various facets of culture, geography, history and more, so that many might grow in their understanding of and love for the Yemeni people. This prayer guide is ideal for individuals or families. We recommend reading the Scripture, information and prayer points during a meal or daily devotions followed by several minutes of prayer. The tragedy currently befalling Yemenis is devastating yet somehow distant as statistics and images flash across our screens from various disinterested news media outlets. As a community of people who care about and pray for Yemen, we want to keep our hearts intimately connected and full of compassion for the individual people who make up this country. This prayer guide is ideal for small groups. We recommend distributing this prayer guide to the members of your small group for personal reading and reflection. Consider watching the videos (also available here) together during your gathering time then taking several minutes to pray corporately according to the included prayer points.